Haydn Kiel has followed in the footsteps of fellow Southport midfielder Fraser Pope, and taken out the NEAFL’s most prestigious individual honour; the Grogan Medal. Pope claimed the gong in a three-way tie last season, but there was no sharing for Kiel; the former Brisbane and Hawthorn rookie polling 21 votes, to finish four clear of nearest rival Cameron Ilett, and five ahead of Sharks teammate Jason Burge. NT on-baller Ilett was leading after Round 19, but Kiel polled six votes to llett’s none in the closing four rounds to take out the umpires’ pick as the League’s MVP, and go some way towards easing the pain of the Sharks’ Preliminary Final exit. Broadbeach’s Ryan Pantic (seventh), with Brisbane’s Jordan Lisle (12 votes), the Cats’ Mitch Brewer (11), and Gold Coast youngster Jack Martin (11), rounding out the top ten. There was no clear favourite heading into the count, and the polling was tight, as expected, all night. Three best-on-ground performances in the opening six rounds saw Lions forward Lisle jump out to an early lead, but the former Hawk’s numbers were always going to dwindle from that point, given he missed a swag of NEAFL matches in the middle part of the year after being elevated to the senior team. Stiller was among the votes early, along with Shelton, Pantic, and Burge, while West Australian prodigy Jack Martin picked up three votes in his first outing in Suns colours; against Mt Gravatt in Round 2. Kiel was sitting on just two votes after eight rounds, but he kick-started his run of votes in 14 rounds with three against Mt Gravatt in Round 9, before two more best-afield showings against Morningside (Round 12), and Labrador (Round 14). But as Kiel surged, so did the NT Thunder captain, Ilett amassing 15 votes between rounds 5-15, to hit the front. With three rounds remaining llett held the ascendancy by a single vote, but the Thunder’s form faded in the last three weeks of the season, and Kiel looked a safe bet to poll in at least two of the last three rounds. As it happened, Kiel finished with three two-vote games – against Eastlake, NT, and Redland – while Ilett went empty-handed, and the 25-year-old Shark took home the prize. Former Lion Cheynee Stiller took out the NEAFL coaches and officials’ choice as the Syd Guilford Trophy winner. 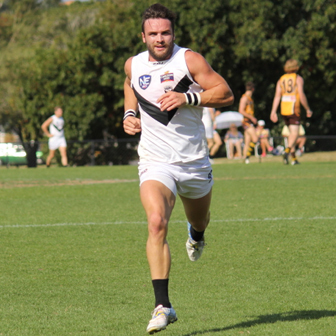 Stiller was the runaway victor, polling 45 votes, to finish well clear of Southport spearhead Josh Baxter (24), Ilett (20), and NT full-forward Darren Ewing (19). Special mention must go to Mt Gravatt midfielder Luke Scott, who finished equal fifth with 15 votes, despite his Vultures side winning just one game for the year, as well as Broadbeach youngster Mitch Brewer (11 votes), who took out eighth as part of a team which finished in eighth spot. Morningside youngster Josh Smith couldn’t kick a late goal to send his sides’ Elimination Final with Redland into extra time, but he did win the NAB Rising Star award, polling 40 votes to finish just ahead of draft hopeful Isaac Conway (32), Panthers teammate Ryley Buntain (27), and mop-haired Aspley forward James Nelis (21). Jesse Wallin (ninth, 8 votes) completed Morningside’s top ten trio, while in Blake Grewar and Luke Rogerson (seventh and eighth, 13, and nine votes) Redland had two representatives, as did Broadbeach, with Lachlan Weller finishing fifth and Kieran Brennan tenth. NT sharpshooter Darren Ewing went one better than last year’s second place, taking out the Ray Hughson Medal as the League’s leading goal-kicker in the home-and-away season. Ewing bagged 94 majors ¬– highlighted by a season-high 14 goals against Labrador in Round 19 ¬– finishing streets ahead of a cluster of players, including Morningside’s Kent Abey (58 goals), NT teammate Chris Dunne (54), Redland’s Josh Pullman (51), and Southport’s Josh Baxter (51). Aspley’s turnaround from ninth place last year to Grand Finalists was recognised with the Hornets’ naming as the Alpha Sport Club of the Year, while Hornets mentor John Blair was named the NEAFL’s best coach. Aspley’s Liam Dawson and Yeronga’s Kate Lutkins were feted as the state’s only All Australians, while Sam Michael and Fraser Thurlow also did well on a representative level; claiming the Zane Taylor and Sam Gilbert Medals for their strong displays in the senior and U22 clashes with South Australia in May. All ten clubs have at least one representative in the team of the year, with Southport heading the count with five players named, ahead of Aspley, NT, and Redland, who all have three players featured.